Regular readers of my reviews know how much I love the Kat Stephenson books - witch/Guardian Kat herself is perhaps my all-time favourite heroine, while the characters who surround her are each brilliantly portrayed. To say I was excited for the release of this novella, which sees Kat at eighteen and ready to make her debut in society, is something of an understatement. But while I knew it would be amazing, I'm not sure I was prepared for it to be THIS amazing! The story sees Kat's sisters try to introduce her to high society only for a task given to her by the head of the Guardians, an unsuitable love interest, and an old friend with issues of her own, get in the way. It's a clever plot and an exciting story, but the real strength is that Kat still has the best voice of any narrator for years, and she's just as vivacious and exciting a character now as she was in the superb original trilogy. 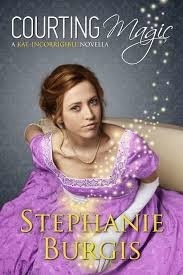 Despite her age this is still suitable for the MG readers who the first three books were aimed at - there's off the charts chemistry between Kat and her love interest, but nothing explicit, just really amazing romance to add to the book's other great points. Speaking of relationships, the bond between Kat and her sisters, as they drive each other crazy at times but are clearly absolutely devoted to each other, is still one of the many highlights of the book. I'm not sure how well it will work for people who've not read the original three, but really, why on earth WOULDN'T you have read the originals, as they're one of the best MG series of the past few decades? (Susie Day's Pea's Book being their only real challenger for me.) If you've not read them, grab them all as soon as possible, and I'm confident you'll fall in love with them and be desperate to read this one. If you have read them, I sincerely doubt that you need me to tell you that this is a must-buy! The new family who’ve moved in next door to Violet Remy-Robinson seem rather odd. 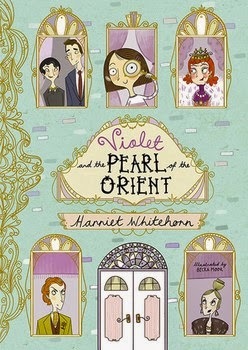 No-one else can see this, but she’s convinced they’re up to no good – and when neighbour Dee Dee Derota has a precious jewel stolen, Violet is sure they’re to blame! Can she uncover the truth and save the day? Throughout the book the two creators are a perfect match for each other - it's a well-told story with a good plot and great characters, but Moor's artwork adds so much to the book, especially in the way she makes the villains looks so horrible. Even though this is aimed at a slightly younger age range than the Sesame Seade books, it reminds me of them a lot – a great heroine, an intriguing mystery, and brilliant use of language. (I particularly liked the glossary at the back of the book to introduce readers to words they may be unfamiliar with.) It’s also absolutely beautifully published – it’s a gorgeous small hardback which is up there with Wild Boy and the Black Terror (another fabulous mystery, although one aimed at children a few years older than the target audience here!) as the best-looking book on my shelves. I think the sheer quality of the production here will mean it’s got great appeal to slightly older readers than the target audience, as well – I can see younger secondary pupils picking this up because of how stunning it looks; I’ve already recommended it to my mum, who works in the English department of a secondary school, as being a brilliant way to get reluctant readers hooked on a series thanks to the beauty of the book, the pictures, and the inclusion of some challenging words with the aforementioned glossary. When an unremarkable squirrel is hoovered up by an out of control vacuum cleaner, Flora Belle Buckman steps in to save him. But the mysterious accident has given him a new life, with super-strength, flight, and the ability to write poetry. As the duo start to make friends, Flora discovers happiness - but every superhero needs a nemesis. Will the pair be cruelly separated? She told me this was one of the best children’s books she’d read in recent years and since she has amazingly good taste in books, I had to get it. Of course, that DID raise my expectations even higher, but I’m pleased to say that this absolutely exceeded them! Told partly in prose and partly as a comic strip, this is completely and utterly wonderful. To quote comic-book fan Flora herself, ‘Holy Bagumba!’, this is a heck of a read. 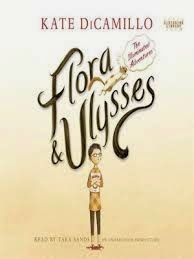 Flora herself, cynical, jaded, and upset with her parents, is a really sympathetic main character, while the superhero squirrel is absolutely adorable, as is his poetry. I thought all of the characters here were excellent, though – perhaps especially the ‘villain’ here, who on the one hand is a formidable antagonist but on the other hand clearly has good intentions deep down. It’s an utterly and completely heart-warming read which completely deserves all of the praise it’s getting.